Plants annual or perennial but short-lived; tufted. Culms 30-100 cm, geniculate. Sheaths compressed, glabrous or sparsely pilose; ligules 0.5-1.4 mm; blades 3-28 cm long, (1)3-7.2 mm wide, glabrous or sparsely long-pilose adaxially. Panicles 3-5(8.5) cm; fascicles 5.5-10.2 mm long, 2.5-5 mm wide, imbricate, ovoid to globose, glabrous or sparsely to moderately pubescent; outer bristles, when present, mostly flattened; inner bristles 8-40 (rarely more), 2-5.8 mm long, 1-2 mm wide, fused at least 1/2 their length, forming a distinct cupule, the distal portions usually diverging from the cupule at multiple, irregular intervals, sometimes diverging at more or less the same level, ciliate at the base, pubescent, stramineous to mauve or purple, flattened. Spikelets 2-4 per fascicle, 3.5-5.9 mm, glabrous. Lower glumes 1-3.3 mm; upper glumes (2.8)3.5-5 mm, 5-7-veined; lower florets sometimes staminate; lower lemmas 3-5(5.9) mm, 5-7-veined; lower paleas sometimes reduced or absent; anthers 1.3-1.6 mm; upper lemmas 3.5-5(5.8) mm; anthers 0.5-1.2 mm. Caryopses about 2.5 mm long, 1-2 mm wide, ovoid. 2n = 34 (32). 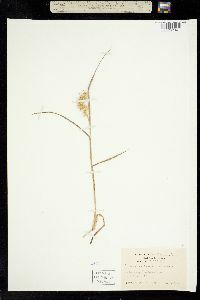 Cenchrus spinifex is common in sandy woods, fields, and waste places throughout the southern United States and southwards into South America. It may be more widespread than shown in the northern portion of the contiguous United States because it has often been confused with C. tribuloides. Cenchrus spinifex differs from C. tribuloides in its glabrous or less densely pubescent fascicles, narrower inner bristles, and larger number of bristles. 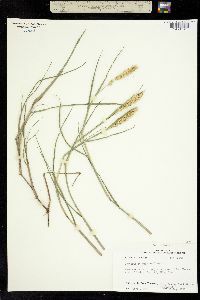 It has also been confused with C. longispinus, but differs in having shorter spikelets, fewer bristles overall, wider inner bristles, and outer bristles that are usually flattened rather than usually terete. This sandbur prefers dry, sandy to very sandy soil and is found throughout the state where its habitat occurs. It is local where its habitat is absent and is frequent to common in the northern part of the state in the sandy areas, where it is a very obnoxious weed. It is found in cultivated grounds and waste places, in sandy railroad ballast, and along roadsides. Annual to short-lived perennial, slender, 3-10 dm; sheaths glabrous or sparsely villous at the summit; blades 2-18 cm נ2-6 mm; bur 5.5-10 נ2.5-5 mm (spines excluded), usually rather shortly hairy, cleft on 2 sides, with mostly 8-40 basally flattened, retrorsely barbed spines 2-5 mm; spikelets 3.5-6 mm, 2-4 per bur, exserted at the tip; 2n=34. Sandy soil; trop Amer., n. to se. Va., Ark., and Kans.